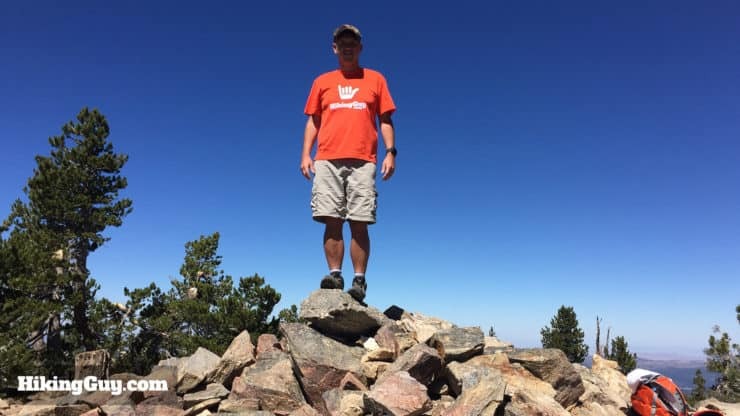 The San Bernardino Peak (10,649 feet) hike is tough but rewarding. The San Bernardino Mountains were named after San Bernardino Peak, which was named by one of the pioneer friars in California, Francisco Dumetz in 1835. I like this hike a lot. 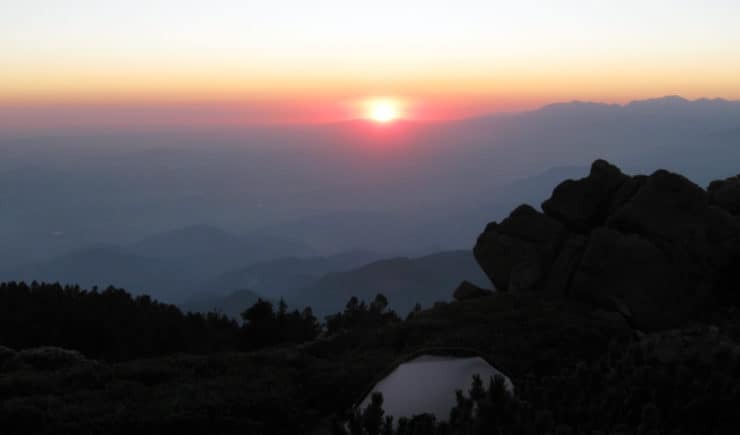 The crowds are light, the fauna is beautiful, and it offers sweeping views of Mt Baldy, Mt San Jacinto, San Gorgonio, Big Bear Lake, and the Inland Empire. You no longer need a quota permit to do the hike. Permits are now voluntary. Permits are voluntary and help the rangers understand traffic in the area (and hopefully get more funding to support these trails). I recommend filling out the permit online here, and then emailing it in to the rangers. Print a copy out for yourself and bring it with you. 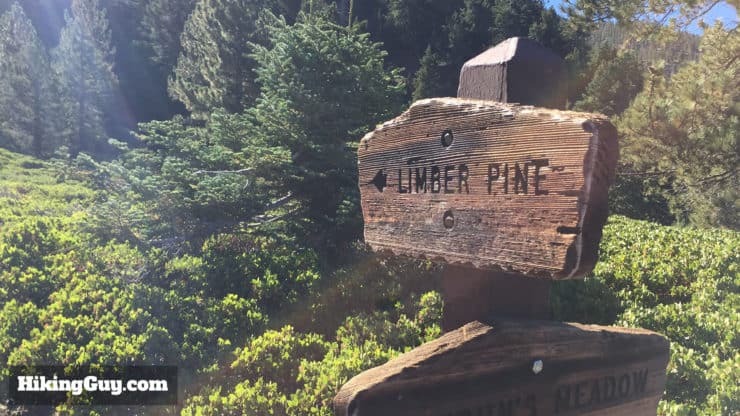 You have the option of splitting this day hike into an overnight backpacking trip to the Limber Pine Bench Camp. Limber Pine Bench Camp is one of my favorite campgrounds of all time. It has flat areas to camp and incredible sunset views. You do need a permit for an overnight hike. Here’s how to get it. Call the Mill Creek Visitor Center at 909-382-2882 and see if there is a space open for the day you want. 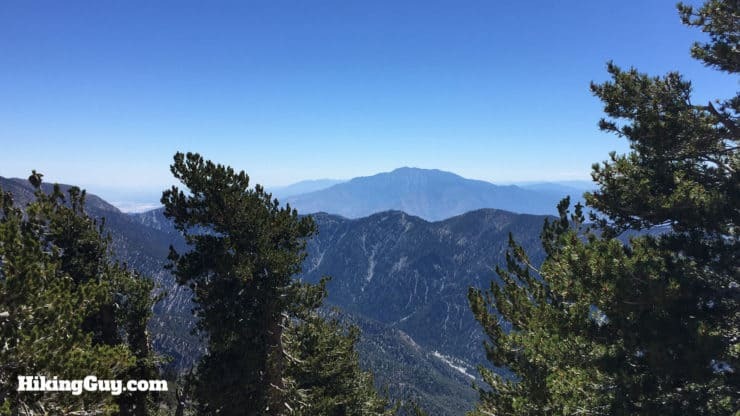 If there are spaces available on your date, go to the San Gorgonio Wilderness Association website and follow instructions on getting a permit. You can send the permit by mail, or for a quicker turnaround, fax the PDF form in. After faxing, I got my permit back within the hour. You can also walk into the Mill Creek Visitor Center and get a walk-up permit. If there are spaces left, you just fill out the form and start hiking. If not, you don’t. There might be a ranger at the campground checking permits. Just show them your piece of paper and he’ll mark it. It’s as easy at that. 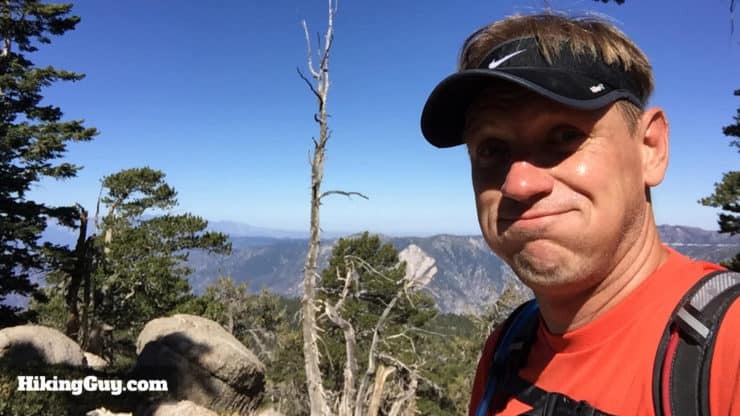 The San Bernardino Peak hike is a tough hike, but not technical. You need a good level of fitness to attempt it. 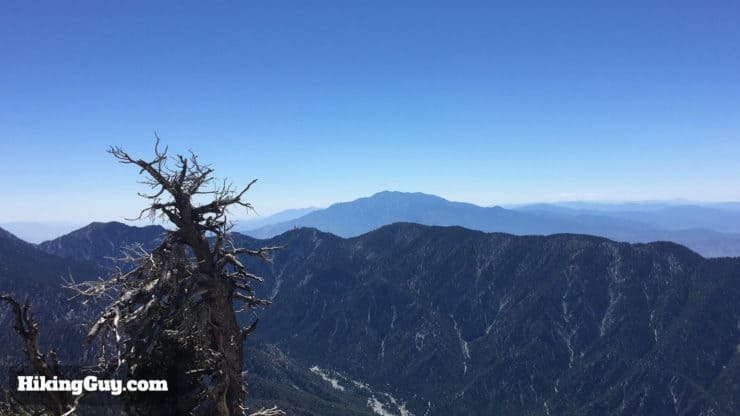 I recommend hiking Cucamonga Peak and Ontario Peak to build up to San Bernardino Peak. You might feel the effects of altitude on this hike, including headache, fatigue, and nausea. If you do, stop, and rest. Make sure you’re well hydrated. If, after resting, you still feel the symptoms, be prudent and turn around. Some people pop a Diamox. 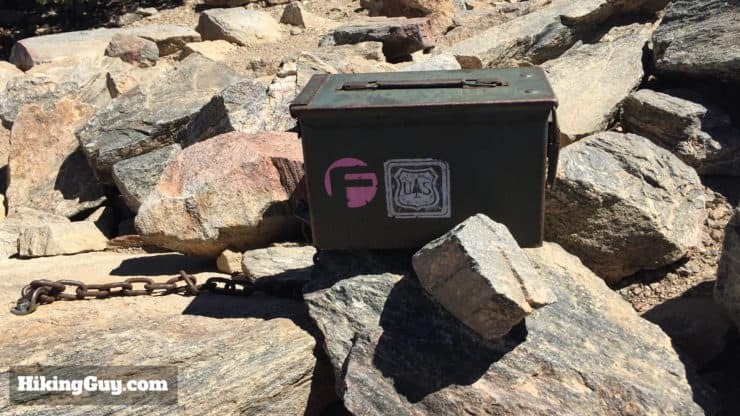 Read the section on altitude sickness on my Mt Whitney guide for more info. 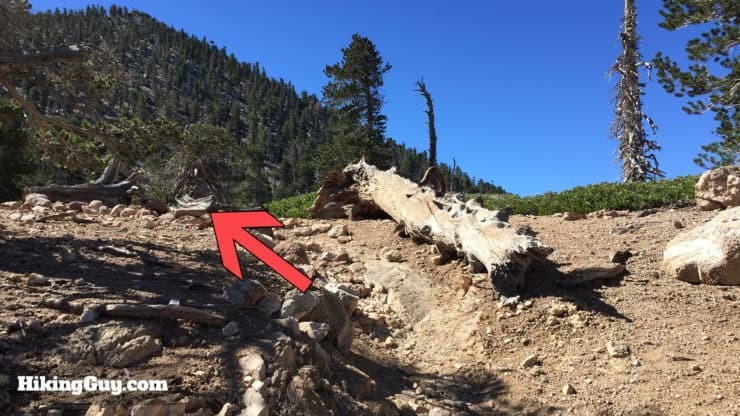 Where Is The San Bernardino Peak Hike? Use this trailhead GPS address: 5766 Frontage Rd, Angelus Oaks, CA 92305, which will get you to the fire station. Detailed directions to the trailhead parking are below. The trailhead GPS address that I listed is for the fire station. Once there, you’ll see this sign for the forest road. Keep going up the road toward IW07. A few feet after that last sign, you’ll see this helpful sign directing you to the trailhead. A big sign directs you onto the dirt road to the trailhead. Note, the tape over the sign is still from when the trail was closed due to fires earlier in the year. Once on the dirt road, there’s a split and trail sign, stay right. Grab a spot in the parking lot. Get here early, the lot fills up. You might have to get creative and park down the road if it’s full. Also, note the cars in the lot. You don’t need a high-clearance vehicle if you go slow on the dirt road. You need a parking pass. I use the affordable National Parks Pass, which gets me in every park, monument, and national forest. You can also use an (Southern California only) Adventure Pass, or buy a $5 day permit from the ranger’s office. This is a tough backcountry hike, and you need to be well prepared with layers, water, and food. Check the summit weather and call the ranger office to check conditions before you leave. Be prepared for changing conditions. 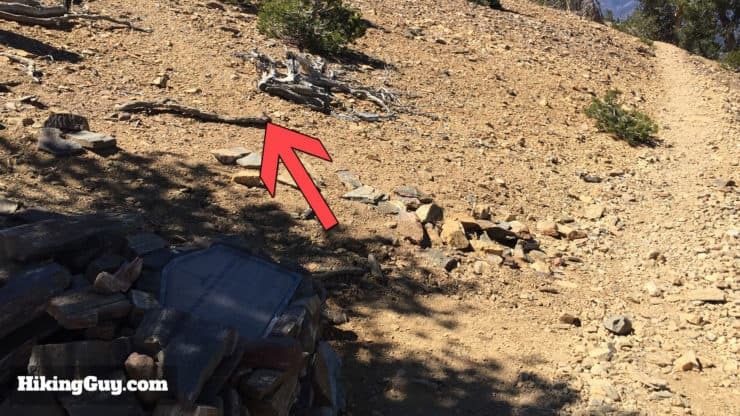 Limber Pine Bench Camp also has a spring to fill up water bottles. The spring doesn’t always have water, so don’t count on it. 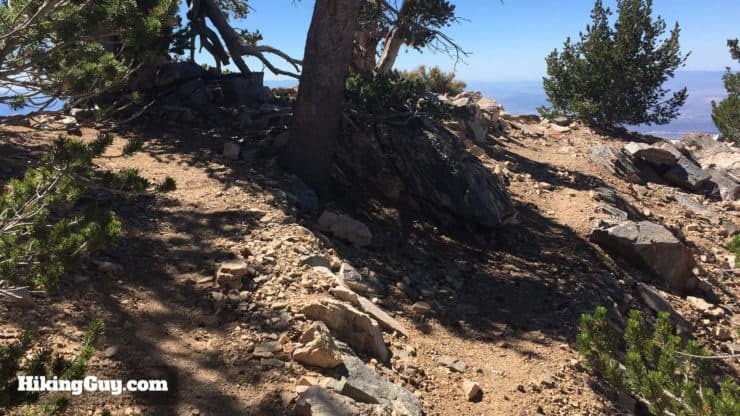 The hike has incredible views for most the way up to San Bernardino Peak. You can see it climbs along the side of the mountain, with nothing blocking the view into the valley. It’s a steep hike but there’s a nice plateau in the middle of the hike where you can catch your breath. Don’t do this hike in the winter unless you have snow and ice hiking experience. The trail starts right by the boards. Ignore the gate at the far end of the lot and start the hike here. Check out the hiking board for any trail notices. The trail climbs for the first few miles. Pace yourself and take breaks. 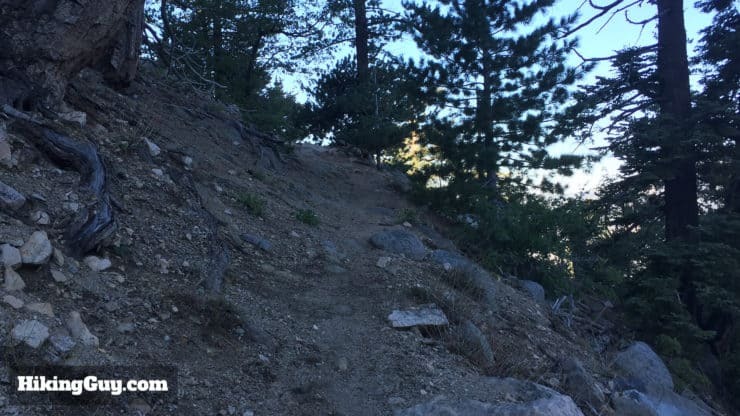 The trail makes it’s way up toward San Bernardino peak on a series of well-designed switchbacks built by the CCC in the 1930s. 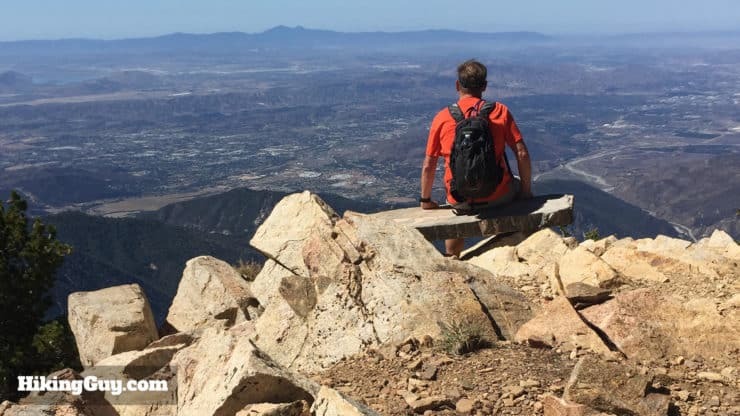 One of the great things about the San Bernardino Peak hike is the views, and they start right from the beginning. Take breaks to catch your breath and soak it all in. You’ll get great views of Mt. Baldy, Angeles National Forest, and the Santa Ana Mountains as you climb this section. 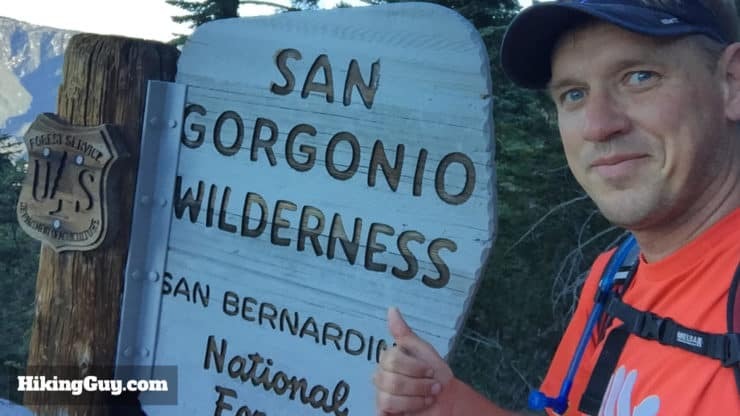 After the majority of the switchbacks, you’ll reach this cool San Gorgonio Wilderness sign. 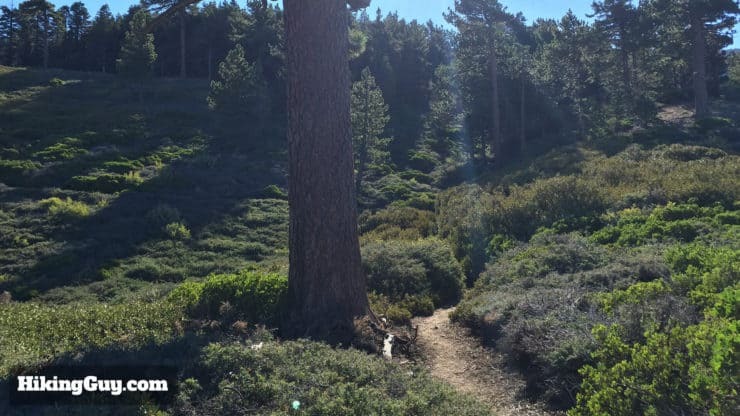 At about 3 miles, the trail starts to level out and you hike across Manzanita Flats. There are great views from Manzanita Flats. To your left are the mountains around Big Bear, to the right, San Bernardino Peak. At about 4 miles, you’ll reach a trail junction. 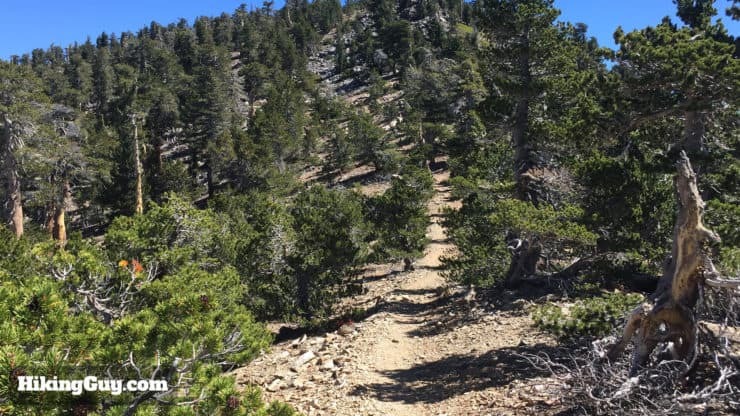 Hike straight through toward Limber Pine. Closeup of the trail junction sign. 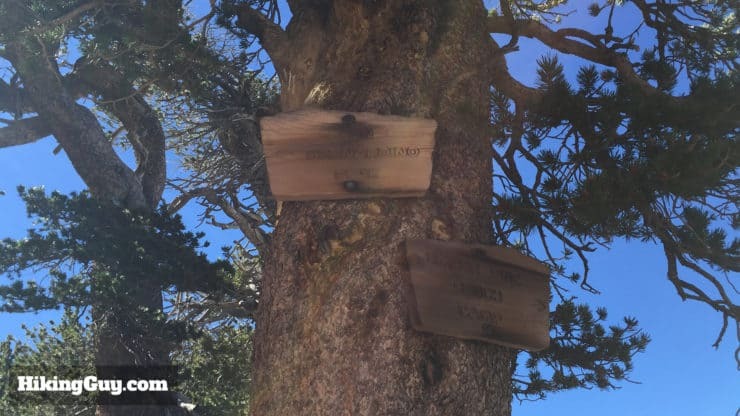 Remember, continue hiking towards Limber Pine. 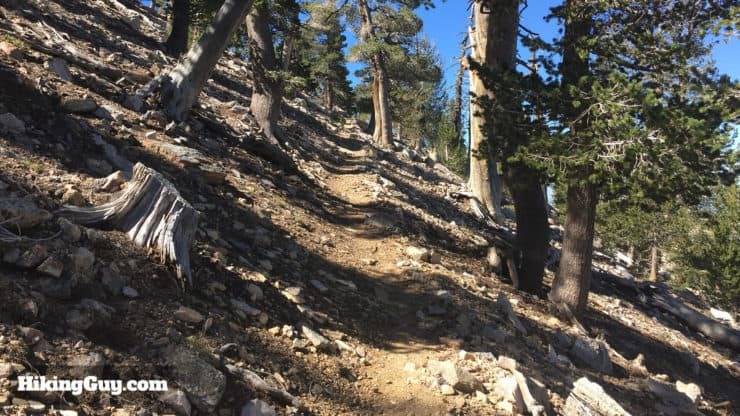 After Manzanita Flats, the trail starts going up again. 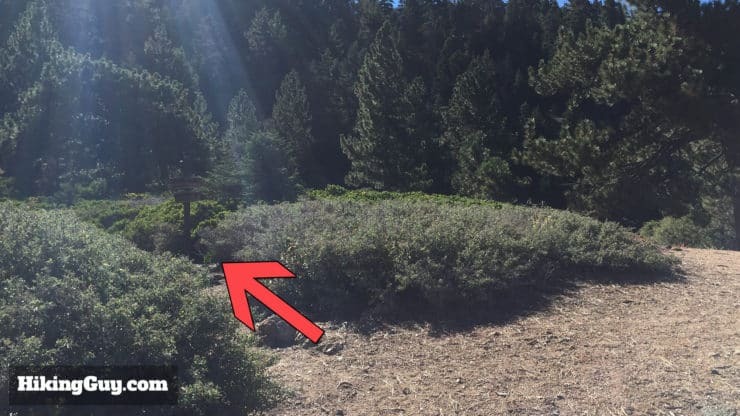 At about 5.7 miles, you reach LImber Pine campground. 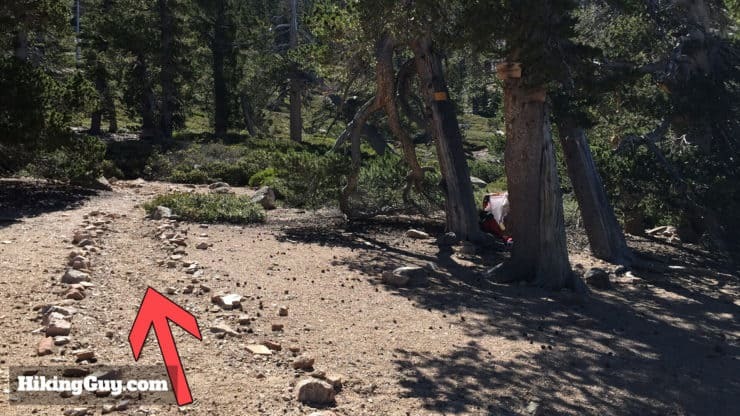 This back-country campground is a great option if you want to do the San Bernardino Peak hike as an overnight backpacking trip. The views from this campground are spectacular. Head to the left through the campground. 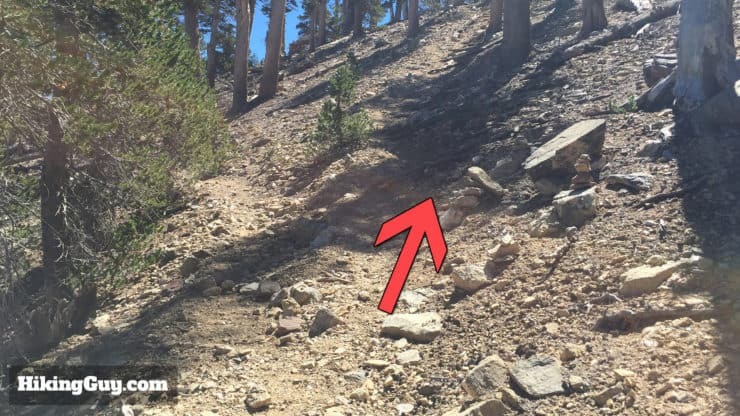 Follow the stone path to the left through the Limber Pine campground. 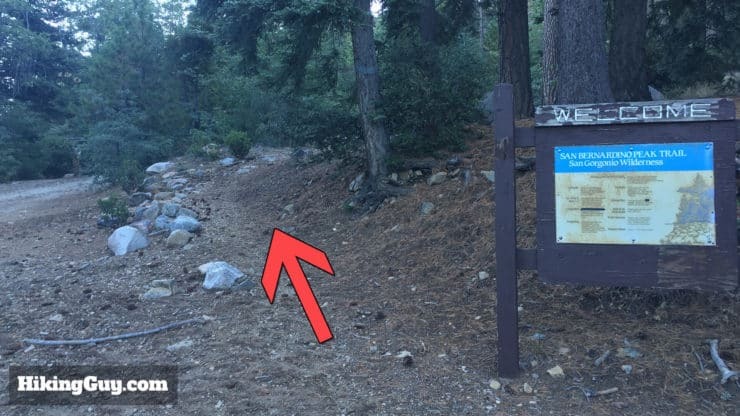 There’s a sign along the trail in the campground pointing you toward San Bernardino Peak. More uphill! The views are incredible as you climb. At about 7.2 miles, the trail goes left, but hike to the overlook on the right. A cool stone bench sits at the overlook. Great photo opportunities here. San Jacinto Peak looms on the horizon. 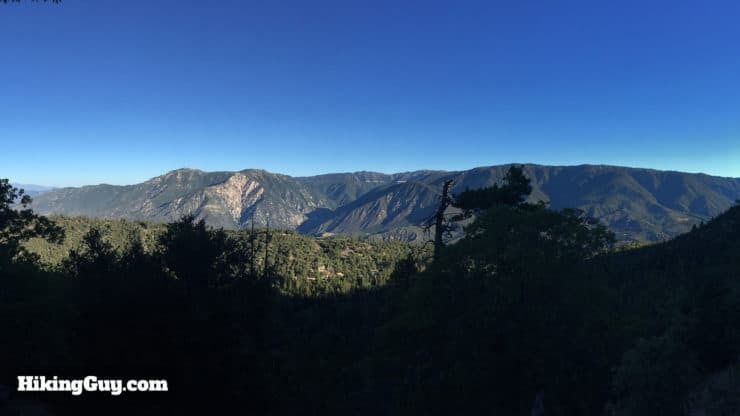 In the valley below, you’ll see Mill Creek and the VIvian Creek trailhead for the hike to San Gorgonio. 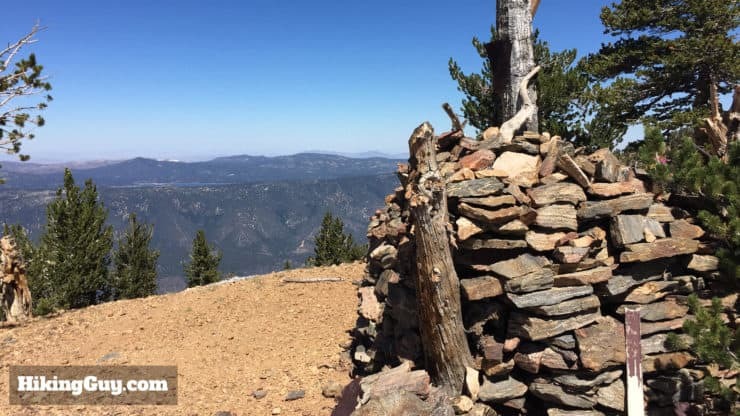 After soaking in the views, continue hiking on the trail to San Bernardino Peak. Almost there! As you climb, you’ll get views of Big Bear Lake to your left. At about 8 miles, the trail splits. Head right up the steep trail for the last few hundred feet to the peak. A small cairn marks the trail junction. It’s easy to miss, so keep your eyes peeled. Success! You did it. The pile of rocks marks San Bernardino Peak. Sign the trail registry, located in the rocks. 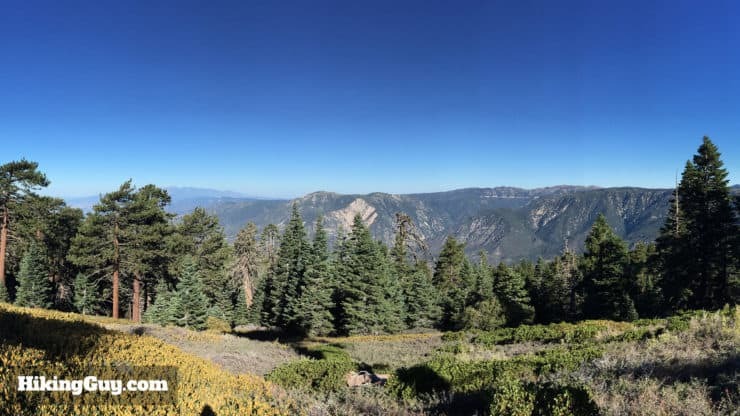 Soak in the views of San Jacinto Peak, San Gorgonio Mountain, and Mt Baldy from San Bernardino Peak. Head back down the way you came to finish the hike. About 10 -15 minutes down the trail, you’ll see a left hand turnoff to Washington’s Monument. A metal sign marks the spot. Hike to the left for the side trip to the monument. 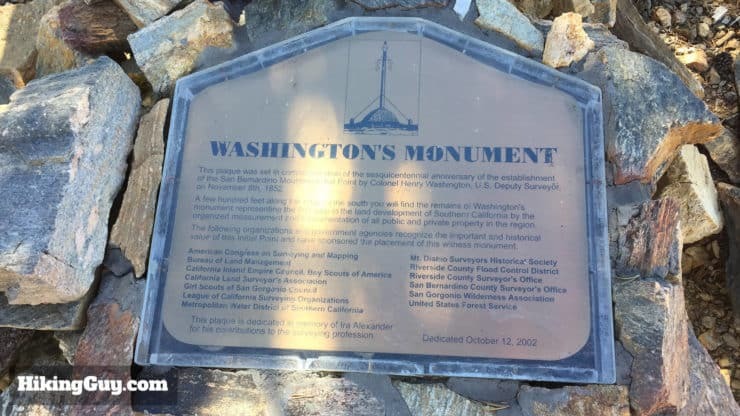 This plaque gives some background on Washington’s Monument at the trail junction. This pile of rocks is Washington’s Monument! The rock pile is actually a sighting point for surveyors, setup by Colonel Henry Washington in 1852. From here, just head back down the way you came to finish the hike.